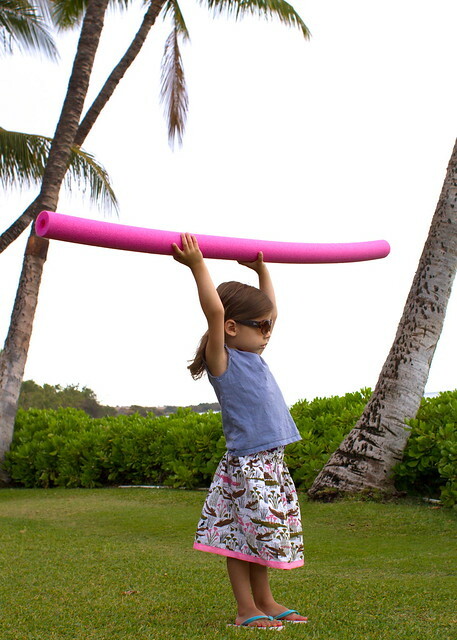 here is Em posing like a boss in hawaii with her pink pool noodle, wearing a skirt full of alligators! 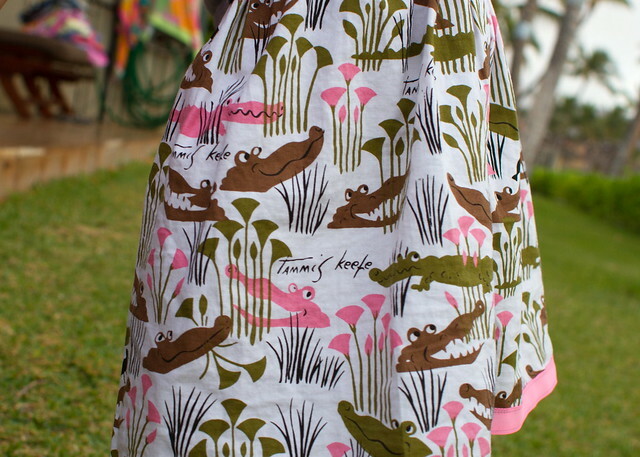 the fabric is tammis keefe tribute later alligator by michael miller, which i picked up at bolt. tammis keefe was a pretty cool lady, you can learn more about her here. i got the fabric when it first came out, and this skirt has been an unfinished object for a long time! i don’t actually have many of those floating around; i tend to finish what i start or it bugs me, but i think i cut this one and sewed the center back seam during a KCWC (maybe last spring?) and never finished it. luckily, i cut it long enough that it still fits my little beanpole. i used the oliver + s free lazy days skirt pattern. i know i’ve mentioned my love for that pattern before; it was my first sewing project when i started to sew as an adult. i’ve made many since. 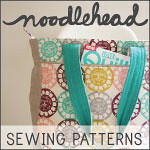 it’s an easy sew, but has a lot of style. 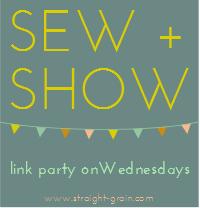 it made me fall in love with making clothes for my kids, liesl gibson commented on my flickr photo which made my stomach do flip flops, and i became quickly addicted to both sewing and the sewing blog community. this little free skirt pattern probably changed my life. sappy? overly dramatic? true. there is one change i make when i sew these skirts: when i first pin the ribbon to the skirt, i align the long edges with each other rather than placing the top edge of the ribbon 1/2″ above the raw fabric edge as instructed. i sew the top edge of the ribbon per the pattern, then trim away all but 1/4″ of the skirt edge before folding the ribbon over to the right side and stitching the other long edge. i think this small change just makes it even easier for a beginner and saves time, because you’re not fiddling with making sure the floating ribbon is right where it should be. you could also simply mark your fabric 1/2″ from the edge with disappearing marker/chalk to guide your pinning and follow the pattern exactly, if your ribbon is so wide you’re worried your sizing might be thrown off by aligning the edges. as i sewed this skirt, however, Em claimed she didn’t like it. i was bummed but didn’t totally believe her (because of the pink ribbon and the fact that “never smile at a crocodile” from peter pan is her jam). but while we were in hawaii, she picked it out to wear multiple days in a row! yay! she actually doesn’t want to wear skirts very often these days – only dresses – so i was pretty relieved. 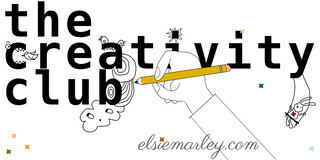 finally, to wrap up what is turning out to be a more emotional post about a skirt than i intended, i want to put in a plug for “skirting the issue,” which is a great new series going on in the month of july from liz and elizabeth, the ladies in charge of project run & play. they are pulling together as many skirts as they can from the greater sewing blog community to donate to girls in foster care around the country. 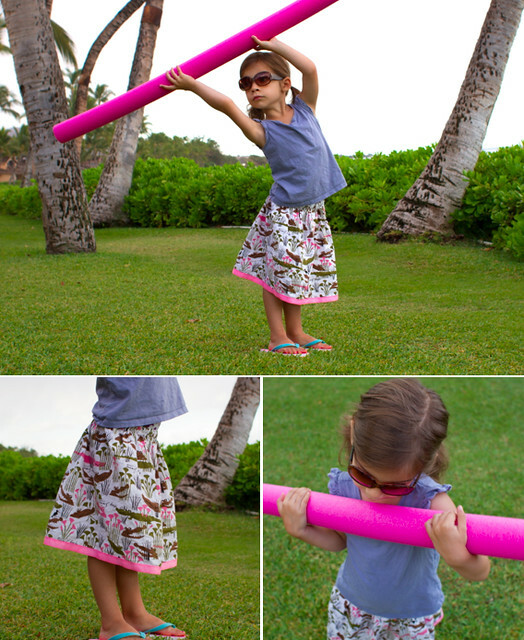 i’ll be posting a fun skirt tutorial later this month on the project run & play blog, but if you would like to sew for a great cause, the lazy days skirt is a great project (especially if you’re a beginner, someone that has a sewing machine but has never used it, or a mother of boys that needs a little girl sewing in her life! if you can thread your machine, you can make a lazy day skirt). find out more about skirting the issue here. okay that’s all. late night slightly jet lagged blogging for the win! adorable! that fabric is fantastic! i love the lazy day pattern, it’s so easy to whip up – and was one of the first things i copied off when i started to ‘re-learn’ sewing! PDX represent! you should make one, elsie needs it. perhaps with dinosaurs for her since she sounds like one. i’m with you, this pattern is a life-changer! 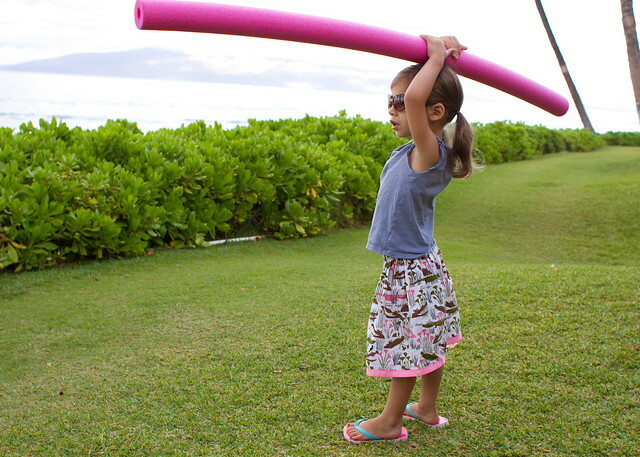 that’s totally the skirt i’d choose to wear in hawaii. perfect! those alligators are so fun! haha! i actually got those from my cousin at my baby shower before she was even born! they’ve gotten lots of use. yay, that’s so cool! which one? Love love love this! 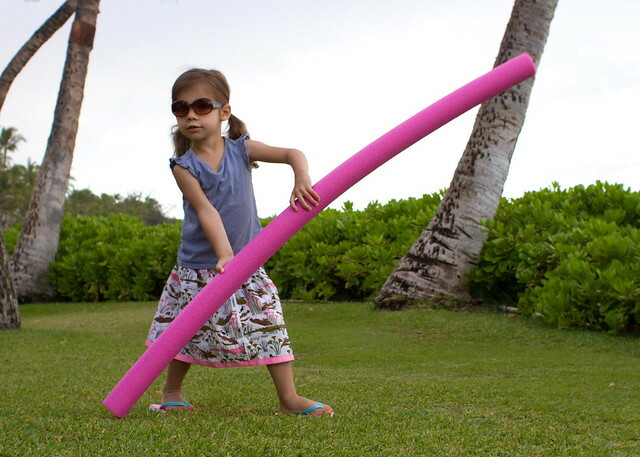 I bought a yard of this when it came out to make a dress for phoebe. I’d better get on that! thanks, emily! oh yeah, i’d love to see what you make. it’s such great fabric. haha, you are too thorough! 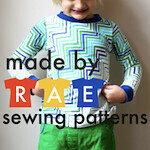 can’t sew and make patterns like you do without being thorough. and smart. but thanks. so love the sweet shades:) and am a tiny bit jealous of your Hawaii vacation . . . hope you guys have a wonderful time! thanks for the pattern tip on the skirt. I love this one! And the photos are too funny. I really should make a couple of these since my Em will be attending a school with no uniforms this year! omg LOVE that fabric, and that pattern. Just made my first Lazy Days skirt the other day too!! Fun, fun. 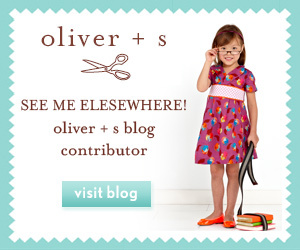 And OK, I have to say: I am *just* now catching up on your blog, and am freaking amazed at your posts this month. SURZLY girl we are halfway through JULY and you have logged like what, 3 guest appearances already. Hokey pete. And you reply to nearly all your comments on both blogs, AND still have time to comment on my blog (and, I see, from reading other blogs, other blogs as well). You are crazy web-efficient my friend, in addition to being amazing! !